Great urban loft for this large space with high ceiling and concrete columns, facing the garden, full of sun. Podium bedroom, office corner, dining room space, storage, garage, wood floor, A/C, roof top terrace and pool. Multi media area, steps to Square Victoria metro, bicycle trail, Old Montreal, Downtown ... Perfect location ! Very nice condo with a lot of windows, in the LOWNEY .Including a roof top pool,BBQ and a spa. on the ground Floor the Exercice Room. 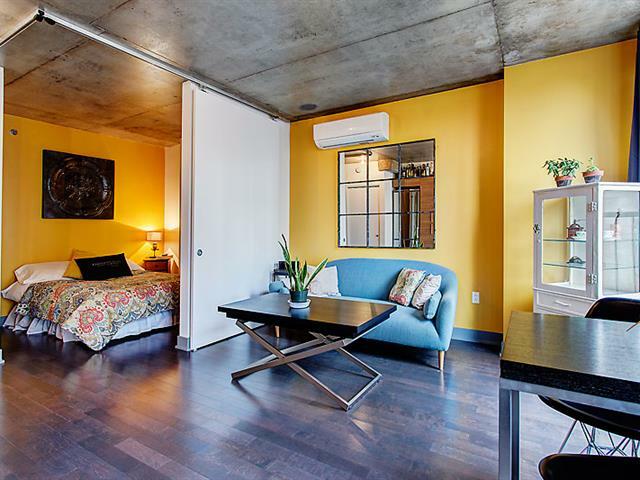 This unit is well situated next to metro Bonaventure, highways, Canal Lachine and the old Port. © 2019 Nathalie Picard, All rights reserved.